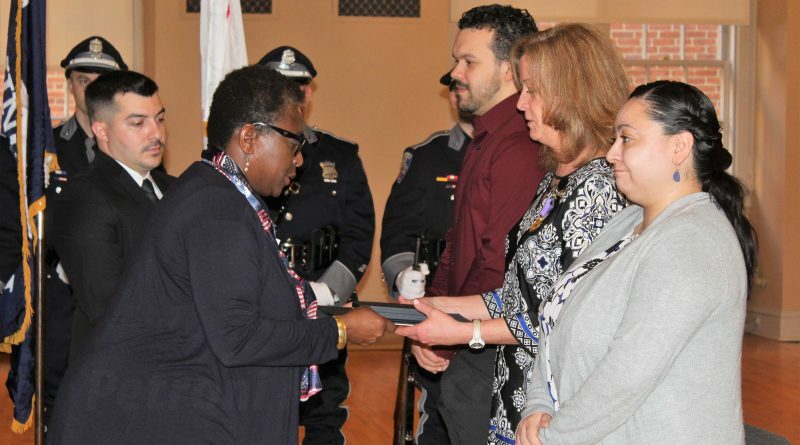 FRAMINGHAM – On Veterans Day, Framingham Mayor Yvonne Spicer presented a Medal of Liberty in honor of World War I Veteran Corporal James J. McGrath, on behalf of the Commonwealth of Massachusetts and Governor Charlie Baker. Corporal McGrath was killed in action on May 31, 1918, while warning others of incoming German shells. McGrath grew up on Meadow Street in Framingham. Both McGrath Square in Saxonville, along with the James J. McGrath Post 74 in Framingham are named for him. He enlisted in L Company, 9th regiment of the Massachusetts National Guard in April 1917. That division raided German lines at Rupt De Mad Creek. Sandi Hughey accepted the medal for the McGrath family.